This Nissan LEAF delivers a Electric engine powering this Automatic transmission. BRILLIANT SILVER METALLIC, BLACK, CLOTH SEAT TRIM, [L92] FLOOR MATS & CARGO AREA MAT. [F01] S CHARGE PACKAGE -inc: Portable Charge Cable 120V/240V EVSE, Quick Charge Port , [G01] MID-YEAR CHANGE, [B93] SPLASH GUARDS, Wheels: 16" Steel w/Covers, Variable Intermittent Wipers, Trip Computer, Transmission: Single Speed Reducer, Torsion Beam Rear Suspension w/Coil Springs, Tires: 205/55R16 AS, Tailgate/Rear Door Lock Included w/Power Door Locks. 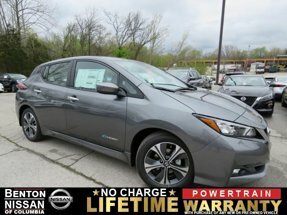 For a must-own Nissan LEAF come see us at Benton Nissan of Columbia, 1510 Nashville Hwy, Columbia, TN 38401. Just minutes away!